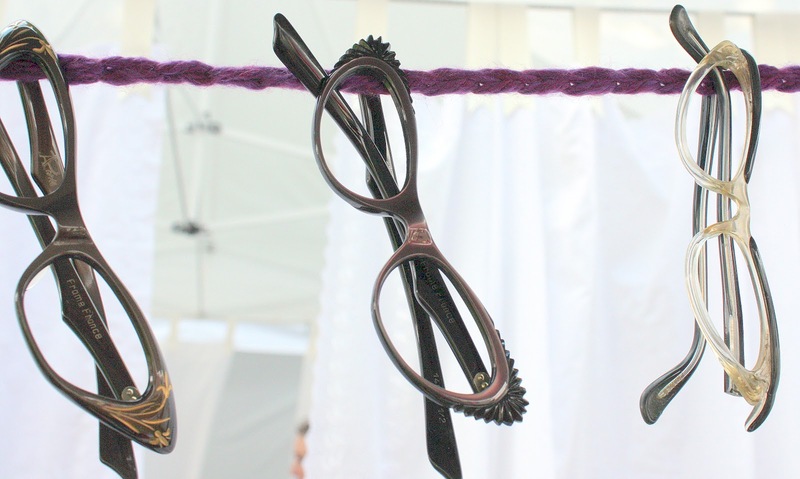 Last weekend I went to the Etsy Team Columbus Eco-Chic Craftacular to support my friend Patti and her booth, to shop for birthday gifts, and since I was in the company of a bunch of creative, green types (my peeps!) break in my new reusable Glass Dharma straw. Hoo boy! I look like a shaggy dog. *cringe* I need to get a hair cut! 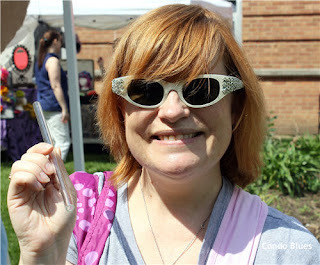 Everyone loved the glass straw and asked me all about it. It was refreshing to hang around a bunch of people who think such things are cool and not weird. Everyone I talked to wanted to know where they could buy one. You can buy reusable glass drinking straws here. My first stop at Urban Handmade set the tone for the day. Then it was on to Gardenia’s Garb to say hi to Patti. 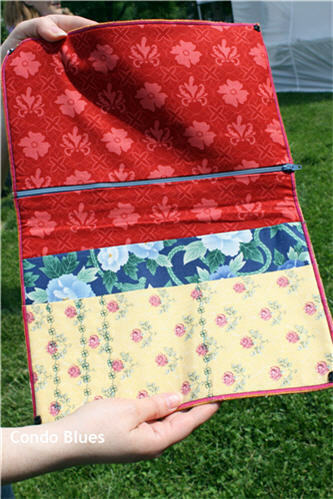 She makes historical clothes, patchwork hats, and sewing clutches. 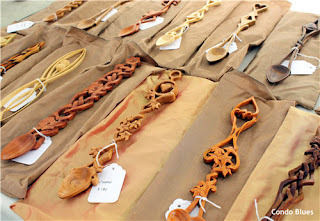 She shared a space with Blake’s hand carved Welsh love spoons. 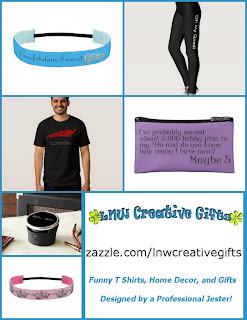 They make excellent wedding presents. I am in awe of this woman's patience and skill. Just look at that detail! The itty bit of Scottish in me picked the thistle as my favorite. Vivisect Apparel is one of Husband and my favorite vendors. 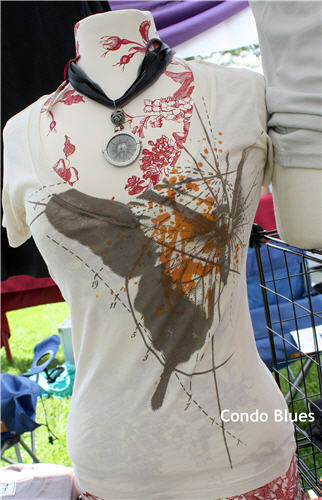 She designs and prints organic and US-made cotton shirts. 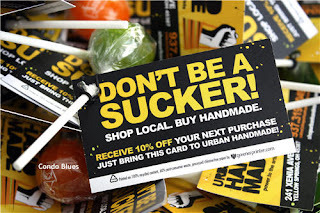 I like that her designs are not the typical green messages you find on organic and Columbus apparel. Vivisect is the stuff I'd wear out and about. The other stuff? Only to yoga class (if I DID yoga) or schlepping around the house. this shirt is a good place to start. HINT! 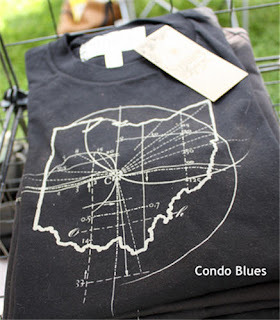 At first glance, this shirt looks like an industrialish diagram. If you look a little closer, you see it’s the longitude and latitude of Columbus, Ohio. 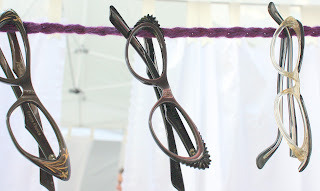 Vintage cat eye glasses? Oh yes please! I was drawn to this booth like a moth to a flame. If you know her name please let me know so I can credit her. Unfortunately, I don’t have her card and her shop name isn’t on my receipt. Yes, I have a receipt. No, I didn’t buy it as a gift for someone. Yes, I bought it for me. 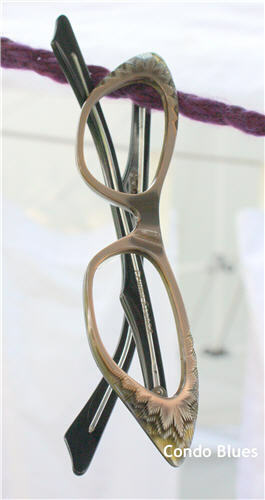 These owlish cat eye frames are stunners! My friends agree they are completely me. My sweetie-darling had to come home with me where they will be loved and appreciated and worn in public as soon as I have lenses put in them. Hedy Regal Designs makes watch face rings that remind me of my paternal grandfather. His hobby was restoring old clocks. exposed gears – which type do you like? 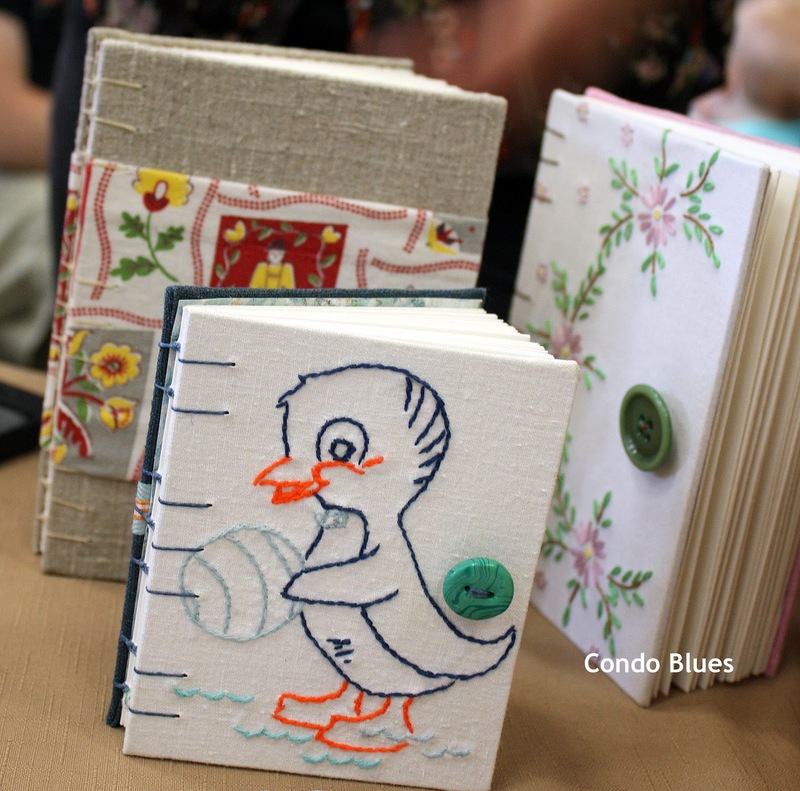 Space Dog Studios rescues damaged vintage linens and repurposes them into journal covers. I found another of my favorite vendors, Honey Run Farm! Husband and I discovered them last year at the North Market Ohio Food and Wine Festival. 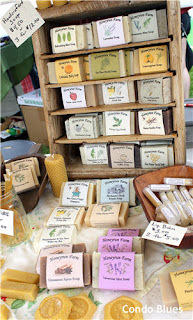 Honey products, handmade soaps (my kryptonite!) 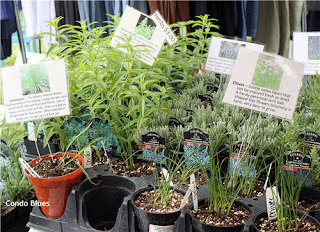 and lots and lots of herbs! You call them herbs. 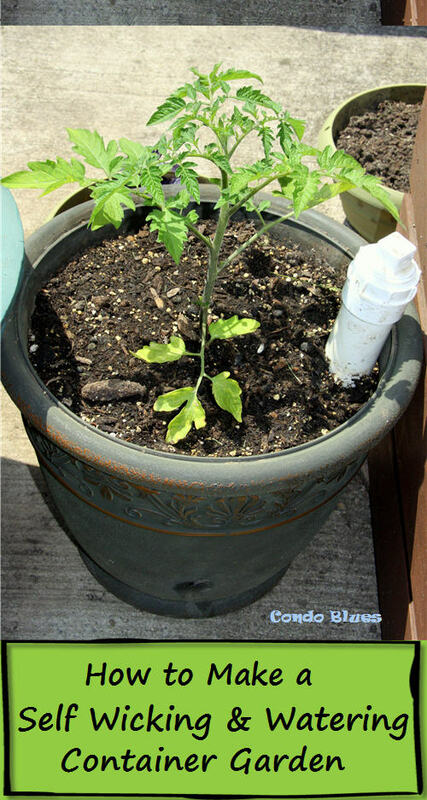 I call them edible landscaping. Before I left I figured I should have lunch. 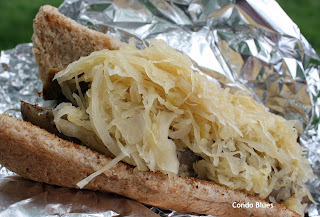 A Rad Dog meatless dog with sauerkraut and onions did the job nicely. 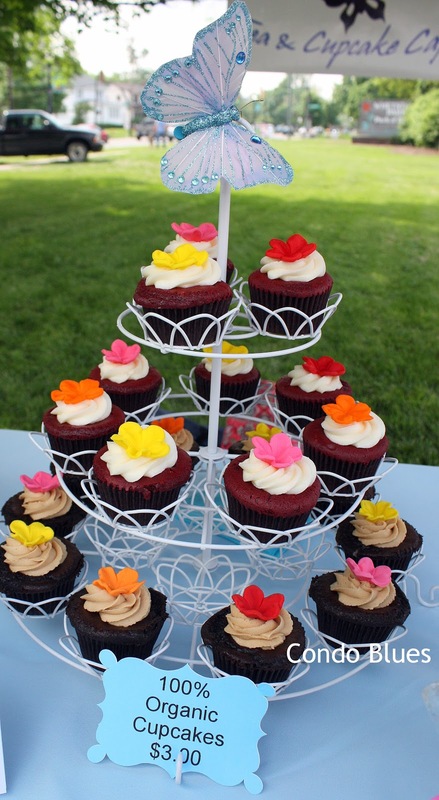 An organic red velvet cupcake from Sugar, Inc. for dessert? Well, sure I can do that too. Eating local and organic is tough, but I persevere. All in the name of helping the local economy, of course. Sounds like fun, wish we had something like that in my area! Very nice craft wares! 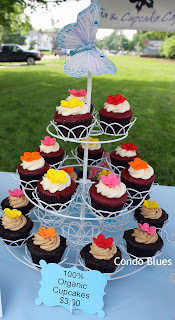 I love your cat eye glasses - and those cupcakes! Concrete Floor Tile Yay or Nay?